I managed to nab Jim K4AXF rather quickly tonight, immediately after my friend W2SH Charles worked him. W2SH is about 10 miles or so from me as the crow flies; but I think he has an advantage over me as far as elevation goes. He is situated amongst the Watchung mountains (hills to you folks who are familiar with the Rockies - but mountains in NJ) where I am only about 150 feet or so above sea level here. 80 Meters is a bit strange here tonight. There's a steady S2 level "whooshing" sound that's annoying as all heck. I have no idea what is causing it. My lovely wife Marianne has been asking me if there's any radio thing that I want for Christmas this year; and I find myself in a bit of a quandary. I don't want her spending a lot of money on me; so I am limited as far as the Amateur Radio world is concerned. I was thinking of maybe the PAR End Fed for 20 - 30 - 40 Meters which is about $75 or so, I think. The price of the Morse Express Christmas keys has been going up and while they are very nice .......... I don't think so this year. I have a few of them already and I'm thinking "Just how many miniature keys do I need, anyway?". Marianne wants me to send her some links to items I would like; but somehow I think she'd have a coronary at the price of a K3 or a Begali. Since I don't want that to happen, I'll keep those links to myself. What are all you hoping to find under your Christmas tree or in your Christmas stocking or for your Hanukkah present this year? It was announced on several of the various e-mail reflectors that Steve WGØAT will be going on hiatus with regards to producing new "Rooster and Peanut" videos. The one that appears directly above will be the last for a while. Steve noted that after all the planning and shooting are done, that it takes another 30 - 60+ hours of post production work to get the editing and audio recording done. That's an amazing amount of work and is truly a labor of love! We are very fortunate to be able to go to YouTube at any time and watch his fine library of videos that he has produced up until now. On the bright side, Steve has promised that after taking some time off to get back to doing some of the other things that he loves to do; that we will see more of him and Peanut and Rooster in the future. Thanks, Steve, Peanut and Rooster for all the enjoyment that you have provided for us throughout the years. And thanks for all that you've done to promote QRP and portable ops using various set ups and antennas. I'd dare say that you've been an inspiration to a lot of us. As far as the CQ WW DX contest from this last weekend goes, I did not put any time in other than just a few minutes. There was so much to do this past weekend that I just couldn't find the time. 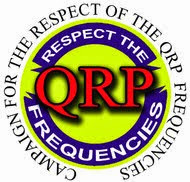 But it was encouraging and enjoyable to see so many QRPers tell of their experiences via the various QRP reflectors. 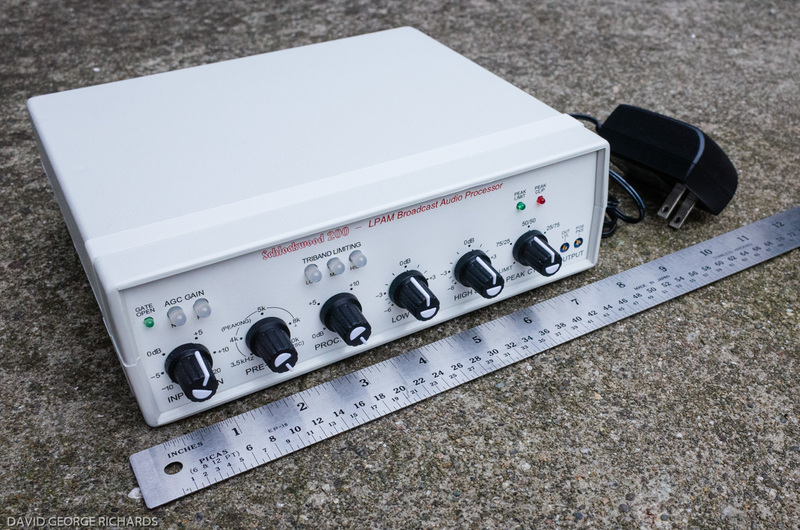 On the PFR3 reflector, I enjoyed the story of one gentleman in particular, who after making a bunch of contacts, decided to scrap the 100 Watt rig for his PFR3. He amazed himself by the success he had via QRP. When the propagation is good, there's nothing as satisfying as working DX with just a few Watts. I did get on 10 Meters on Sunday just for the halibut. I worked Uruguay and a few other South American countries with 5 Watts; and they were really booming in. Makes you yearn for even more sunspots and more activity on 10 Meters! 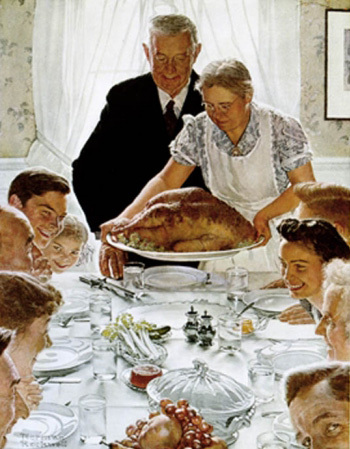 Tomorrow, in the United States, we celebrate Thanksgiving Day. Every year around this time, I make a list on this blog of all the things that I am thankful for. Indeed, there are so many, that it's hard to believe that we set aside only one "official" day to give thanks to the Almighty for His abundant blessings. I am thankful for the mess to clean up after a party because it means I have been surrounded by friends. I am thankful for the taxes I have to pay because it means I have a job and I am employed. I am thankful for the clothes that fit a little too snug because it means I have had enough to eat. I am thankful for the lawn that needs mowing, windows that need cleaning, gutters that need fixing because it means I have a home. I am thankful for all the complaining I do about the government because it means we have freedom of speech. I am thankful for the parking spot I find at the far end of the lot because it means I am capable of walking. I am thankful for my big heating bill because it means I am warm. I am thankful for the lady behind me in Church who sings off-key because it means I can hear. I am thankful for the piles of laundry and ironing because it means my loved ones are nearby. I am thankful for weariness and aching muscles at the end of the day because it means I have been productive. And finally, I am thankful for the alarm that goes off early in the morning because it means that I am still alive. So, from the W2LJ household to all of you .... we extend our most sincere best wishes to you for a safe, warm, happy Thanksgiving Day. May you have an enjoyable day with family, friends and good food! Tonight I pulled my first stint as an 80 Meter Fox. Conditions were strange. Loudest signals were heard from the Midwest - Illinois, Iowa, Wisconsin, Minnesota. Usually on 80 Meters, the louder stations are from the South - Virginia, Georgia, the Carolinas, Tennessee and Kentucky. Not so tonight. I did work a fair share of stations from those states; but they were not as loud as I have grown accustomed to. The pelt count was not great and I called "CQ FOX" a lot. It's definitely more fun handing out pelts than calling CQ. Also, listening for weak stations with the AGC off for an hour and a half is probably not the best thing for the ears, either - but it beats a day at work any day! What's that old QRPers saying ???? "A bad day behind the radio is better than a good day at work." My next stint is a Tuesday in early January. In fact it's the Tuesday after my surgery which was scheduled for January 7th. I am hoping that with the colder Winter weather that's undoubtedly coming, that better conditions on 80 Meters will be coming also. Woo hoo - nice surprise !!! A small, thin packet of QSL cards from the W2 QSL bureau was waiting for me when I got home from work today. Inside was my QSL card confirming my 17 Meter QRP CW contact with VP6DX, Ducie Island from back in February of 2008. As the QRPer's motto goes, patience really does pay off. Patience, two separate monetary donations, a whole ton of e-mails and a two year and nine month wait - but it did finally come. To be honest, I had given up a while ago and figured "that's the way the cookie crumbles". But it's nice to have the card! I had to double check the calendar. I had thought for sure that tonight was the 40 Meter QRP Fox hunt. Oh wait a minute ...... it IS Thursday night! I'm just not hearing anything - Foxes or hounds tonight. And that's a shame as their is hardly any background QRN and the band is pristine! I am hearing some stations calling "CQ NS" however and sending an exchange with the word "DUCK" in it; so I am assuming there is either some kind of practice going on or perhaps a weeknight contest of some sort? I am definitely not the Contest Guru; so am not sure at all. I do see a skunk pelt in sight for tonight however. Conditions are beautiful and I can't hear a peep out of either Fox or Hound pack. How ironic! Late note ...... finally found Rick NK9G. He was mostly at ESP levels but occasionally popped up to about 559. Unfortunately, hearing him is quite tough as he is being alternately covered up by a QRQ station and F3NB calling"CQ DX". Even with the K2's tightest filter, it's a mess on that frequency. However, the French station is way is way stronger, so I guess the band IS long tonight. The good news for the day was that I nabbed two pelts in the 80 Meter QRP Fox hunt this evening. Both Drew K9CW and Andy K1RA were worked without much difficulty - a testament to their fine ears and equipment and aerials. The not so great news for the day is that I will be having the parathyroid surgery sometime after the New Year. A visit to the surgeon pretty much confirmed that. I have to have two more tests done - a bone density scan and a thyroid ultrasound. After that, a date for surgery will be scheduled. Recovery time will be about a week to ten days at home, followed by no heavy lifting at work (no more than 10 pounds) for a month after that. It seems it either comes down to surgery now; or an enhanced possibility of more kidney stones and osteoporosis in the future. Since I don't want to be bogged down by a broken hip when I'm in my 80s, the choice seems fairly logical. On the bright side, I was explained that the procedure should take no longer than a half hour or so. A local anesthetic and sedation is all that will be required; and I will be home the same day. Doesn't sound too bad right now; but I'm sure the night before, I probably won't get much sleep! I took part in the annual Autumn ritual today - raking leaves. Or rather, I should say, blowing and vacuuming leaves. God bless the man at Toro Company who thought up the combination leaf blower / leaf vacuum! I spent about two hours cleaning up the backyard and then about an hour cleaning up the front yard. You know what's disheartening though? Coming back to the backyard after cleaning up the front yard only to see the backyard look like I never touched it! Many leaves literally jumped at the chance to replace their fallen comrades. The good news, though, is that it looks like maybe one more week and all the leaves will be off that sugar maple in my neighbor's backyard. This is the tree we had to have topped about five years ago. I'm thinking that once the leaves are all gone, I just might be able to get the center of my G5RV up another ten feet or so. It's regained some of its stature in these past five years. The maple back in December 2005, right after being topped - it has gained about 10 - 15 feet back. I did get some time to head down the basement and tune around for a bit. I heard VP2V/NY6X calling CQ on 17 Meters and handling a bit of a pileup. Of course, the British Virgin Islands is an easy trip from NJ, but it was still fun and gratifying to be heard among the clamor with only 5 Watts. I managed to snare Naoki on my second call - a testament to his superb ears and his superb operating skills. That more than made up for the leaves! 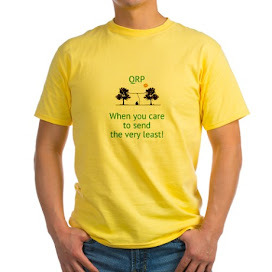 QRP When you care to send the very least! This may be the hardest email I've ever written. At 5:33 a.m. this morning Henry Richard Kohl passed away from respiratory complications in the ICU of Henry Ford Detroit. Hank was surrounded by his wife Kathie, son Andy and friends Trish and Stan Arnett. Per his wishes there will not be a funeral, but a memorial service will be held sometime in the Spring. Kath extends her thanks to everyone for their cards, prayers and well wishes. I never met Hank face-to-face; but we met on the air dozens of times. There were also dozens of private e-mails between us concerning a topic of interest we both held. I will miss his observations, his wit and his friendliness. Till we meet again, Hank! May the DX be plentiful and the propagation always wonderful! Two simple words from the English language ..... "Thank You". Can they ever be enough to let you (the Veterans) know how I feel? They will have to do. I have no other means of conveying my deepest gratitude. Thank you for your service to our country. 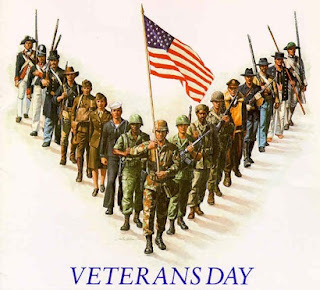 Thank you for your sacrifices. Thank you for everything! And for our departed veterans, Lord please shine your face upon them and allow them to enjoy Your light for all eternity. Amen. As a QRPer you probably have a million of them - who doesn't? If you're like me, you might have a small stash of kits waiting to be worked on (ie, started! ), or perhaps you have a schematic for a transmitter, receiver or some other station doo-dad that you want to complete over the Winter. 1) The finished product has to have a good feel. I don't want to make something and then never use it, only for the thing to take up space and collect dust. 2) It has to be heavy enough so that it won't wander all over my operating table. 3) I want it to look good. I want to be able to be show it off without being embarrassed. So, I have started trolling the Web for some basic ideas. Maybe I can glean enough and then expand upon other ideas. After all, that's how a lot of things come about ..... no? Improvements on existing ideas. These should be enough to get me started. The planning phase will probably take the longest. The idea is not to make anything that I would consider "superior"; but just to have fun, and build something useful with my own two paws. and not hearing too much of anything. Of course, I really don't have a great antenna for 30 Meters. The G5RV is a pretty bad performer and the Butternut is OK; but not great. I did hear PJ2/K2TQC managing a pretty good sized pileup; but by the time I found him, his signal was fading fast. I stayed with him for a bit; but then reality took hold and I went searching other parts of the band. 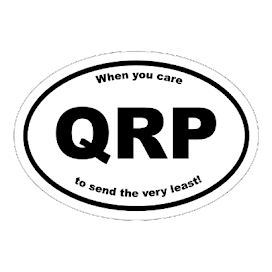 I called CQ for a bit around the QRP watering hole and found no takers. I then went back to listen to the PJ2 station, but he was so weak as to be almost non-existent. The "normal" bands are filled with Sweepstakes stations, and that's really heartwarming to hear. The contest doesn't pull me in the least, though. Back in the 90's I used to participate to get the "100 Contacts" pin that the League offered. Do they still even do that anymore? I guess my attention span (or maybe my back and backside) are better geared for shorter 2 to 4 hour Sprints. I admire the die hard contesters, though. They have drive and stamina that I could only hope for. At the same time, I think about how accustomed we've become to having computers in our shacks. I remember in my early Ham days, when everyone kept a paper and pencil dupe sheet. Wow, we've come a long way! I'm sure some folks still use the old paper and pencil method, but I'd also be willing to wager that that is becoming rarer and rarer. For my involvement in the QRP Sprints, I still keep my log with paper and pencil and transfer to the computer after the fact. With the number of QSOs that I generally make, a dupe sheet is not necessary. When you only make 20 to 30 contacts in a couple of hours, it's real easy to see if you've worked a guy before on a given band. Everyone have fun in the Sweepstakes this weekend! This is not one that I normally participate in; but back when I was working on WAS, I found it a nice vehicle to cherry pick the rarer states that I needed. Now that we're entering the colder months; you just might find those rarer ones aplenty on 40 Meters in the evening. My sincerest apologies to Rick NK9G. It has been pointed out to me that I crossed some sort of line and had attacked him with my post below about not making it into his Fox log this past Tuesday evening. To Rick and to all the readers out there, that was not my intent. I did not want to show anyone up, dress anyone down, or humiliate anyone in public, or least of all, look for "revenge". It was suggested that I remove that post; but that would not be the right thing to do either. I will let it stand, for what it's worth, along with this one. I said what I said, and I've never denied my own words before. The childish thing would be to "make it all go away". So now, I am typing new words; and I stand by these, also. To Rick NK9G and to anyone else out there who feels I betrayed a trust, you have my most sincere apology. I was picking my kids up from school the other day, when I ran into one of the other student's fathers in the parking lot, who happened to be a Ham also. He saw the callsign plates on the Ford Explorer and took the opportunity to shake my hand and introduce himself. "W2LJ, you're into QRP and CW, right?" he asked. Hmmmmmm ..... I guess he is either a reader or he saw my car before with the little QRP sticker on the back. Anyway, we chatted for a bit and it turns out that he's "a Believer" too! 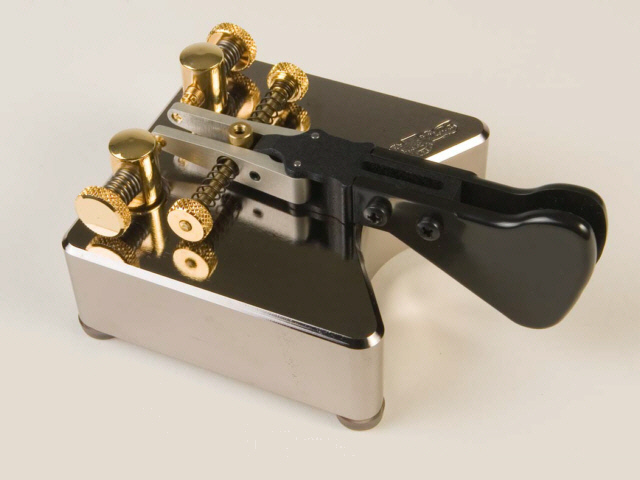 He has a regular QRO rig; but also a Ten Tec Argonaut for QRPing and a set of Begali paddles. Those are yet another thing to add to the lottery winning list, along with the K3, new laptop and all the other little things I would love to have but can't afford. As a matter of fact, I went to the Begali website just today and was drooling over the Simplex Mono single lever paddle. You know, the price doesn't seem too bad until you convert those Euros into US Dollars. Talk about sticker shock! Beautiful, isn't it? Courtesy of the Begali Website. Something else to dream about these coming Winter nights. Hey - US Hams ...... don't forget that we "fall back" and turn our clocks back an hour this weekend. I didn't make it into NK9G's Fox log the other night. Hmmmmmmm ..... I think it would have been better to have just read the log and discovered my call missing. I was heard (obviously); but guess my exchange wasn't copied. That's what I'll have to assume as no cogent explanation was given. So I commented about the beginning of Fox hunt season last night; and sure enough the concept was new to some of the newer QRPers out there. I got some private e-mails that, "It sounds like a lot of fun; but ......."
It is fun and it is easy! And to show you how easy it is; I will take you through it step by step. This way, you can jump in with both feet Thursday night and you will sound like a grizzled veteran. This Thursday night's hunt will be on 40 Meters. The good news is that you only need to concentrate on a very small slice of it - from 7.030 to 7.050 MHz, in fact. In that span, you will have two furry foxes hiding in the weeds. This Thursday, they will be Pat KZ5J and Arn KØZK. Somewhere in that frequency patch, if you listen closely, you will hear them call "CQ FOX". To make things even easier, they will split up. One of them will be hiding in the 7.030 to 7.040 patch, while the other will be hiding in the 7.040 to 7.050 patch. Odds are that they will be operating split, meaning that they will transmit on one frequency while listening on another. You're job is to figure all this out. Don't be scared - it's not all that difficult! Let's say for example you come across KZ5J calling 'CQ FOX DE KZ5J U" on 7.035 MHz. This usually means that he will be listening for you to call him on or about 7.036 MHz. The "1 up" rule is not written in stone. It's up to you to listen up and figure out exactly where he is indeed, taking calls. Once you discover that, you either make use of the split button on your rig (or the RIT knob) to call on his listening frequency, while in turn listening for his transmission on his transmit frequency. A tip here - just put out your call once or twice - do NOT keep sending your call over and over and over. This will not accomplish anything except cause a very messy pile up! If you are lucky to have been heard, you will then probably hear something like this, and I will use my call for the sake of the example. If he missed any part of your exchange, he would ask for a fill at this time. You might get something like "NAME?" or "PWR?" If you get one of these you need to make sure he gets all your information for a valid exchange. If everything went well, you will probably hear something like TU QRZ DE KZ5J FOX U signaling that he's ready to take on the next hound. And there you have it - a pelt in the bag and the opportunity to go find the other Fox. 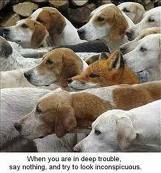 If you hear the "U" or a "D" after the Fox's call that means they are listening up or down - usually 1 kHz, but not always! Sometimes it could be more and sometimes less. That's up for you to figure out. As the pileup thins and it gets late into the hunt, it's not unusual for the Fox to stop operating split and begin operating simplex. This can be determined by there being no "U" or "D" after his call. As you can see, listening and listening well is the key to success. Just aimlessly putting out your call over and over and over again will not guarantee you any ind of success - in fact it just might make for an angry bunch of hounds. See you in the pack of Hounds tomorrow night! Another QRP Fox hunt season has begun. It started tonight on 80 Meters and will continue Thursday night on 40 Meters. The season will last until March of 2011. A lot of hunts and a lot of fun. I have volunteered to be a Fox for 80 Meters once again this year, with my first turn coming the Tuesday of Thanksgiving week. Tonight the Foxes were N0UR, Jim in Minnesota and NK9G, Rick in Wisconsin. I found Rick early on and was hearing him only weakly; so I decided to go look for Jim. N0UR was loud and I bagged his pelt fairly quickly. Jim and I seem to have a pipeline to each other. It's a rare day when I cannot work him, or visa versa. Rick was hard work on the other hand. It took the entire hunt time allotment to snare him. I grabbed his pelt with literally minutes to go. When signals are weak, sometimes it takes patience (a LOT of patience! ), timing and persistence. Some times just tweaking your transmit frequency a hair; so that your received signal tone will jump out to the Fox's ears is the way to go. Some nights, all the patience, timing, persistence and "tricks" net you nothing. But that's the way it works in the world of DX pileups, too - and that's the purpose of these hunts ...... to hone operating skills for the bigger events where a QRPer might need every edge he or she can pull out of his or her sleeve. If you have never tried a QRP Fox hunt before, thinking that it might be too hard or intimidating .... think again! Jump into the fray and have some fun (and sometimes some frustration too) - but usually the fun outweighs the frustration. One thing I guarantee you, you will learn the capabilities and limitations of your equipment, antennas and yourself, very quickly.